cPLR Tester is a unique diagnostic instrument for rapid screening of retina and optic nerve function using evaluation of the pupil light reflex after chromatic stimulation of rods, cones and melanopsin containing retinal ganglion cells(intrinsically photosensitive retinal ganglion cells – ipRGCs) with a red and blue light. Testing procedure can be done within 30 seconds providing immediate information about functional status of the retina and optic nerve. Illumination with strong light source always results in the rapid and complete pupil constrictions. Lack of the pupil response after red light illumination, with normal response after blue light illumination is indicative of retinal disease (NO RED – GOOD BLUE = RETINAL DISEASE). 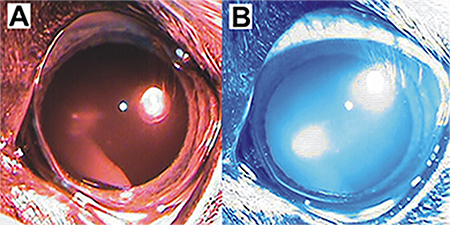 Lack of the pupil response after red and blue light illumination is indicative of the optic nerve disease (NO RED – NO BLUE = OPTIC NERVE DISEASE). IN MANY PATIENTS ABNORMAL PUPIL RESPONSE TO CHROMATIC STIMULI (RED AND BLUE LIGHT) IS THE VERY EARLY SIGNS OF RETINA OR OPTIC NERVE DISEASE, WHICH CAN PRECEDE VISION PROBLEMS FOR MONTHS, ALLOWING IMMEDIATE THERAPEUTIC INTERVENTION.